There are three cards in the package, together with assembly instructions. 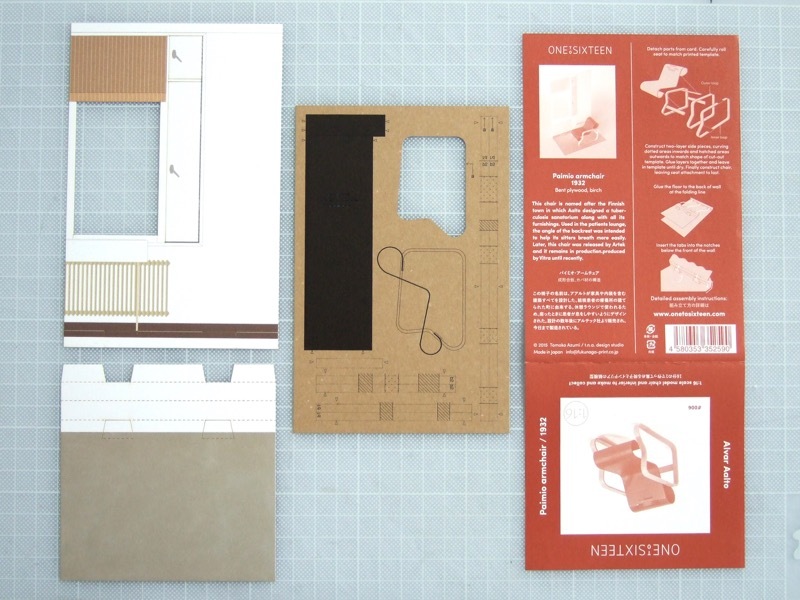 Detach all parts of the chair from the centre card, using a craft knife/scalpel – connections are indicated by little triangles. First of all, assemble 2 loops of legs and arms. The longest strips will be the outer layer of the loops. Using the template in the card as a guide, as below, place ‘a’ on leg to ‘a’ on card. Curve defined areas between two lines – dotted areas for inside curve and hatched area for outside curve. It is best to use a sharp solid corner, press and roll each piece with the ball of your thumb, then smooth the curve with a thin round stick. And place the outer layer inside the template. Curve the inner layer with printed ‘b1’ and ‘b2’ letters. Place each letter against the division line in between, check the curves are nicely overlapped. Apply glue in between the layers, filling the curves especially, and leave them in the template until dry. Assemble the other loop in the same way. Then shape the back-and-seat curve using the template for guidance. Roll the laser half-cut areas firmly, until they stay in shape without holding. Colour the cut edges of the seat with a Black pen, to make a nice finish. Refer to the side view to locate the black coloured crosspieces. Glue them level with each end of the seat. Adjust the length of the sticking out ends equally. When the crosspieces are dry, assemble the loops and seat together. Locate the Black seat crosspiece in between the two lines inside the loop. Glue it in the position where the end of the crosspiece is in the middle of the width of the loop. In the same way, glue the back end to the loop, in between two lines under the arm. As a result, there are little spaces between the seat and the loop, as arrows show. 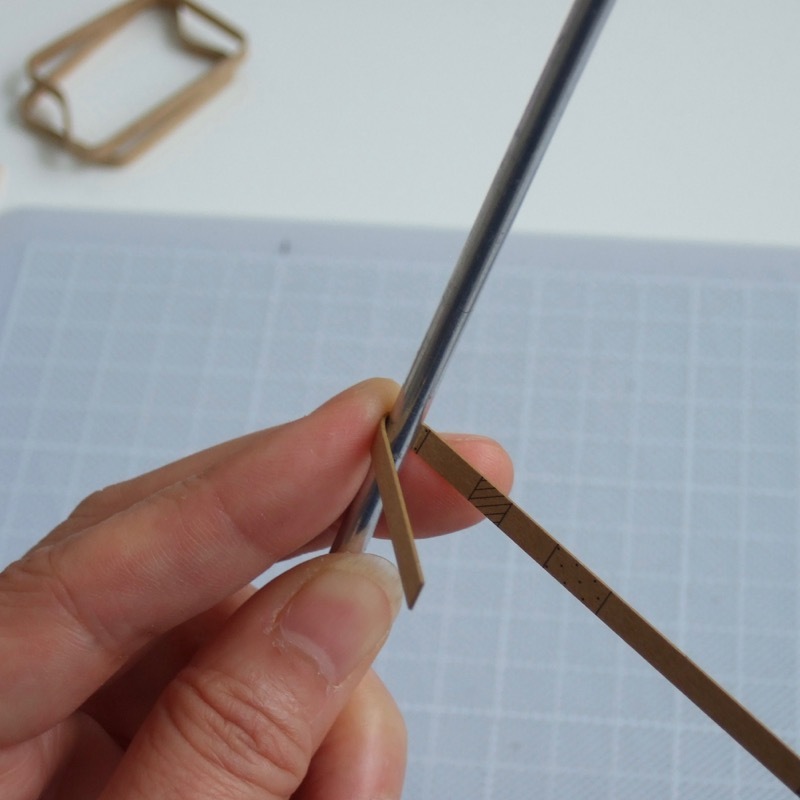 Attach the final piece in wooden colour – glue it to connect the back of the two loops, at the middle point of the back legs. Adjust any twist or distortion, and add some glue to the connections from inside. Leave it under tape or clip and wait for it to dry. You may want to colour the edge of the seat with black pen at this point – be careful not to touch the loop. The last step is to assemble the wall and floor. Please refer How to assemble background, and fold open the air-ventilation windows to complete.